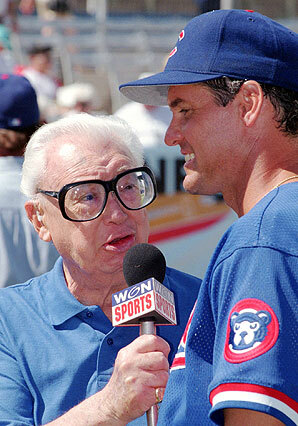 Harry Caray, bless his heart, had a fascination with names. Players, teams, countries, no-one was safe from his imagination. He would criticize people who's last name sounded better to him as a first name. For example, he thought Jose Felix would sound better if his name were Felix Jose. Harry thought the Florida Marlins should be called the Miami Marlins because they play in Miami. Harry did not seem to care that the Marlins actually play outside of Miami. His hotel was in Miami, and he ate dinner with Steve Stone and Arnie Harris in Miami. At one point early in the 1998 season (I think), the Cubs' Henry Rodriguez and Sammy Sosa were both leading the National League in Home Runs. They both are from the Dominican Republic. Harry thought it would be a great idea if the Dominican Republic changed the name of their whole country to "Sosa Rodriguez". Harry's other memorable move was to spell names backwards. Greg Maddux was Gerg Xuddam, Shawon Dunston was (of course) Nowahs, and Ryne Sandberg was Enyr Grebdnas. He would work 162 games for a consistently bad team every year and still seemed like he was having the most fun in the world. Sure, the losing got to him. He wanted the Cubbies to win, and it got pretty sad towards the tail end of his career, when he began to accept the fact that the Cubs wouldn't be winners in his lifetime. On the air, he would say some pretty heartbreaking things during the postgame shows after tough losses. Unfortunately, this chain of love and madness between Cubs fans and losing cannot be broken until the Cubs of the future actually win a World Series. To take a page out of the Billy Crystal playbook, it's not funny. It's not fun. It's not funny anymore. There are millions of Cubs fans who have not been able to outlive the Cubs futility. It seems like my beloved Chicago Cubs are running in place this young season. On the Mets' broadcast Monday Night, Keith or Ron mentioned that they weren't seeing any life from the Cubs. Usually, that is a fatal blow to a manager's tenure with a club. Of course, no one should accuse Lou Piniella of anything because of this. Sometimes, there is little a manager can do, even should do. At this point in the season, the veteran Cubs don't need a manager trying out crazy theories from his laboratory. Fans used to say "In Dusty We Trusty", and it's evident that the fans, front office, and ownership also trusty Sweet Lou. 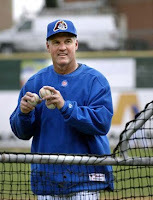 Can I get started on my feelings about Ryne Sandberg as future manager of the Cubs? When it comes to matters as dear as this, it is hard for me to open up. I'll try anyway. It seems the Cubs organization is providing adequate training for Ryno. A few years ago, he started out riding buses, while managing a rookie ball team. He progressed up the ranks and is currently the manager at Triple-A Iowa. If/when he takes the reigns from Lou Piniella, he will presumably have relationships with some homegrown players on the big club. This is not a case where a team takes a legendary player and throws him in the dugout, as manager, trying to see if he may revive old team glory. For these reasons, and others, I think Sandberg might actually be the manager who eventually brings a title to the Northside. 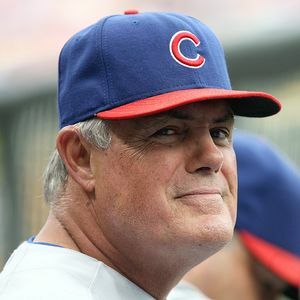 Part of me is less optimistic about the Hall of Famer as the next Cubs' manager and feels, deep down, that we could be talking about a 110+ year drought if he's next in line after Piniella's deal expires. In my youth, I grew up with Sandberg at 2nd base every day. He was the NL starting 2nd baseman every season, too. This, of course, meant that he would have the All-Star sticker in those baseball sticker magazine books my Mom would get me at the supermarket every year. He won the gold glove every year. He led 2nd basemen in Home Runs every year. In my opinion, he never seemed to want to get his uniform dirty and dive for a ball in the hole. There were rumors that Rafael Palmeiro was traded for Mitch "Wild Thing" Williams because Raffy did the Wild Thing with Sandberg's wife. I'm not holding that against Ryno, but maybe, just maybe, he wasn't the greatest teammate. It was evident, because of the Gold Gloves, All Star starts, and unprecedented home run totals, that he was a Hall of Famer at the end of his career. Ryno admirably left millions of dollars on the table, walking away from guaranteed money, retiring when he didn't think his performance was worth his gaudy salary. See if anyone born after 1990 has ever heard of an athlete doing that. By any estimation, that was an extremely classy thing to do. Of all those facts above, I can't get over the fact that I wanted him to dive more. Most fans didn't care because he seemed to have great range and kept winning gold gloves. In Cuban baseball speak, there is a term call a "postalita". That is someone who thinks he's cool, thinks he looks good, peacocks around, doesn't want to get dirty, basically think he's hot stuff. My dad thinks A-Rod is a postalita. I think Cristiano Ronaldo is a postalita. I thought Ryno was a postalita. I never want a postalita managing my team. I want a good teammate to be the manager of my club. I guess that's basically what it boils down to. The food at Citi Field is tremendously overrated. Maybe Shake Shak is a great fast food burger, but the line during the game is obnoxious and frankly it just looks and smells like a boatload of salt. The Caesars Club at Citi Field was really strange. There's nothing there but some furniture, TV's, and a bar. It looked like a lousy sports bar in a mediocre suburb's shopping mall. Seeing former Cubs in the Mets' starting lineup, Angel Pagan and Henry Blanco, brought back lots of memories. Geovany Soto and I both miss Henry Blanco very much. The Mets should get rid of Rod Barajas and trade for Geovany Soto because he would be great again with Blanco mentoring him. 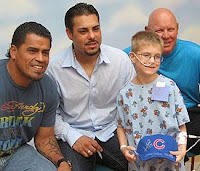 Carlos Zambrano looked much better than I expected. He barely gave up a couple of runs with 2 out, but it could have been a different story. I blame outfield defense for allowing too many hits/bases. TV announcers say that Marlon Byrd is good at defense, but I don't buy it. There isn't enough data for me to trust defensive metrics on this season, but my eyes tell me that he is not even an above average defensive Centerfielder. He's a 4th Outfielder, or the #8 hitter on a really good team. Mike Pelfrey looked shaky at first, then really settled down. The first three hitters in the game took him to a full count, and he had 57 pitches with a runner on and two out in the 3rd inning. His next pitch got him out of the third. A 1-2-3 inning in the 4th really settled him down, and the Mets cruised to an easy victory after that. It's not a good sign for the hopes of Cub fans in 2010. This veteran team may just be 'running in place', but they're getting worked by the Mets. And, the Mets stink. We'll get a closer look tonight, sitting in box seats for my personal nightmare pitching matchup of Carlos Silva vs Oliver Perez. Anything is possible.